HIROSHIMA, Japan -- Will Mazda Motor Corp. take a page from Subaru's playbook and enter a new segment with its proposed Koeru sporty crossover concept? CEO Masamichi Kogai said the concept, which debuted in September at the Frankfurt auto show, envisions a new entry for the small Japanese automaker. 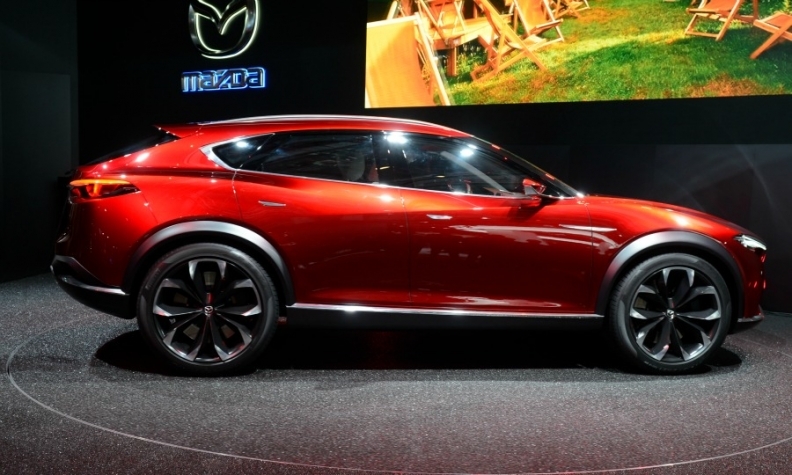 Dousing speculation that the Koeru previews a performance variant of a nameplate such as the CX-5 or upcoming CX-9, Mazda's boss said the concept is unrelated to anything in the carmaker's lineup. "It's a totally new car. It's a lower, sporty SUV. It's close to a wagon," Kogai told Automotive News at the company's headquarters here. "The CX-9 rides higher. So does the CX-3 and CX-5. [The Koeru] aims to generate more driving pleasure." He likened the vehicle to the Subaru Outback, saying: "That kind of genre. We'd like to see how it is evaluated globally, so we are collecting customer feedback." The Koeru, a low-profile, fastback five-door crossover/wagon, would be about the size of the CX-5, but slot beside it as a sporty alternative, Kogai said. Any production version that goes up against the Outback would have plenty of volume to siphon but also plenty of loyal buyers to win over. Subaru sold 136,227 Outbacks in the U.S. through November, a 9.8 percent gain from the year-earlier period. The total is more than Mazda's combined sales for the CX-3, CX-5 and CX-9 in that period.